Set contains 47 filters, includes Light and Ozone packages. System requirements - PS 5.5 or above. Almost since the beginning of photography, photographers have been putting special glass filters on their cameras to change some quality or aspect of the image striking the film. Over the years these filters have gained a high degree of sophistication offering the shooter a wide variety of both corrective and special effects filters. Corrective filters can range from Polarizing filters for shooting in snow, at the beach or other 'high glare' situations, Neutral Density filters (ND) filters use to reduce the amount of light hitting the film, color correcting filters for balancing the color temperature of the existing light and even simple 'Skylight' filters, clear glass used to protect the expensive and delicate coatings on modern lenses in harmful environments. The other type of filters found in the photographers arsenal are what I call 'special effects' filters. Mist, Softening, Diffusing, Split Gradient, Star, Streak, Tint, Glow filters, etc. The drawback to using these special effects filters is that the effect becomes part of the image. If at a later time you want to change the effect or remove it entirely, you can't, you are stuck with it. As a consequence, many photographers, myself included, shunned the use of special effect filters, either that or shoot everything twice, once with filters and once without, not always possible when doing 'run and shoot'. The only option would be to add effects while printing in the darkroom. If you have ever worked in a darkroom you'll know how limiting the options are in this regard. My how things have changed. With the onset of digital photography and applications such as Photoshop, we now have the option of shooting 'as is', with no filters and then adding filters in post production, in Photoshop. Not only can we audition different filter effects, we can tweak the effects to achieve exactly the look we want. 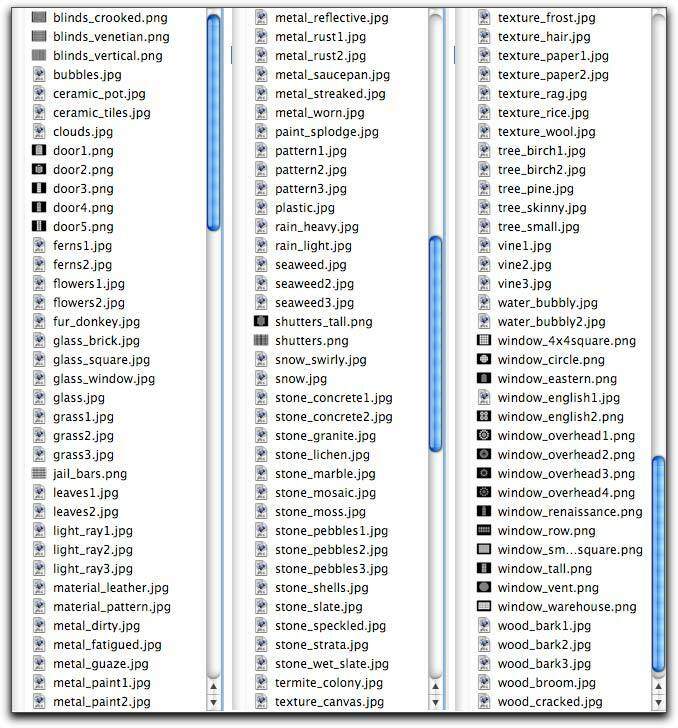 With a image open in Photoshop you will find an entire library of special effects. These stock filters are amazing, but look closely and you will notice that while there are some basic and a number of razzle-dazzle digital effects, there are few of the classic photographic filters. Enter Digital Film Tools with their package of 47, 55mm Digital Optical Filters for Photoshop. Described as: "Glass camera filter simulation, specialized lenses, optical lab processes, film grain, matte generation, exacting color correction as well as natural light and photographic effects." You can check out these filters at 55mm Digital Optical Filters which provides before and after examples of each filter. In addition, you can download demo versions of the filters as well as a PDF version of the manual by clicking the Downloads link located on the right side of the 55mm product page. In many of the 55mm filters, a matte or selection is generated to create the desired effect. 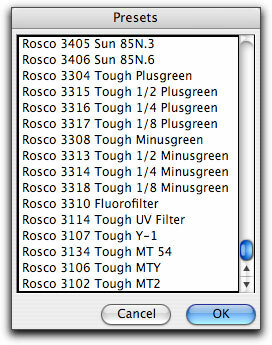 The matte controls consist of Position, Range and Blur parameters, and they work the same in all of the filters. The white areas of the matte are the areas that will be affected by the filter, while the black areas remain unaffected. The Matte is extracted based on luminance using a proprietary image slicing algorithm and is created using the Position and Range parameters. For the purposes of this review I will look at just several 55mm filters, filters that I would use on a regular basis although I certainly would use most of the filters in this package in my work, in fact, I already have started using them. If you will look at the list above there are a number of filters that you will recognize, however, these filters are not 'one trick ponies'. Even the more basic of these filter offer a wide range of control and even provide 'Blend' (Composite mode) for an even greater range of effects. There are three Mist filters; Black Mist, Mist (natural) and Warm Mist (warm). The original shot is on the left, 55mm Warm Mist filter applied on the right. The 'Glow' settings has two options, Spread and Subtle, subtle is selected here. Blend is set to 'Screen'. Changing the Blend (Composite Mode) to 'Add' gives a different look to the image. The Filter offers a Color setting, clicking on it will produce a color wheel which you can use to change the base color for the warming effect. There is yet a more articulate way of controlling the image from right inside the filter. 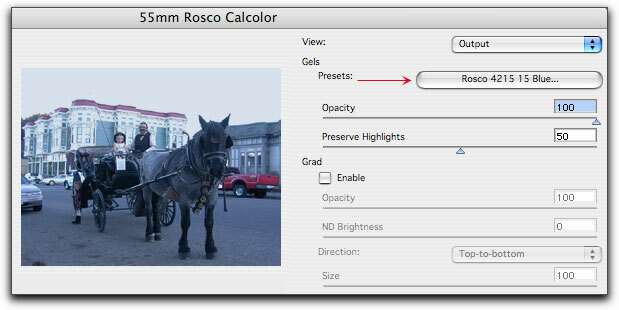 Select 'Color Correct', shown below, and you are provided with a full array of CC controls. When shooting, a photographer may want to change the mood of the entire scene or change the color temperature of the lights, different colored gels can be placed in front of the lights. These same effects can now be created in 'post' by using the 55mm Rosco gels, and with a much great degree of control than you would be able to achieve when shooting. Below left is the original shot with a 'bald' sky and on the right with the Rosco Calcolor filter applied. You will notice that the entire image displays an equal amount of color tinting, not always what you want, however, 55mm gives us a way of controlling the size, shape and placement of the gel on the image. When you check the Grad Enable box the even tint become a graduated tint with control of the direction of the gradation; Top-to-bottom, Bottom-to-top, Left-to-right and Right-to-left. When enabled, four small boxes appear in the corners of the image. You can drag these for boxes to any position in the image to shape the area that the gel is applied to. Just as in the real world where you can purchase a variety of different colored gels for your lights, you are not limited to just a few gels in 55mm. 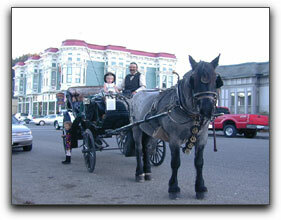 As shown below, there are a large number of Presets that you can choose from. Once a Preset is selected you can further modify the look. You can achieve either very subtle changes to your photo or make the changes as dramatic as you want. The Light Filter is a very powerful tool. It enables us to throw light into the photo in 'post'. Included with the Light filter is a library of over 110 patterns or templates, shown below. These patterns are completely malleable, you can control every aspect of the pattern. 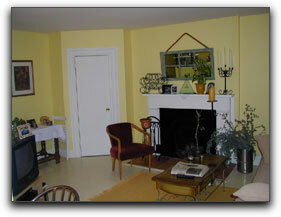 Below left, I have a shot of a living room. After applying the Light filter, below right, I have first selected the 'Shape' option. Clicking on the Browse button opens up the library where a pattern is chosen, in this case, Venetian Blinds. 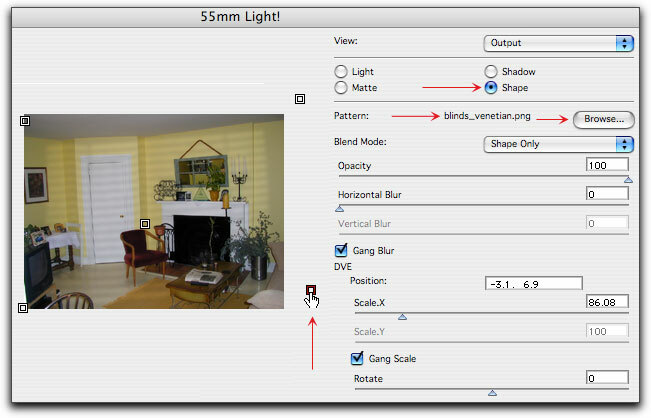 There is the option to change the Blend (Composite) mode; Shape only, Add, Subtract, Multiply, Screen Difference, etc. Selection of different blend modes provides radically different effects. Here I have Shape only. 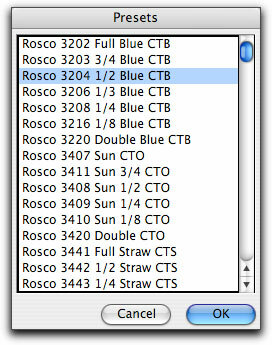 In the Preview window you can shape and place the effect by dragging on the four box handles. You can change the size of the pattern, control the amount of blur and opacity, even rotate it. Switching back to the 'Light' mode we are afforded additional controls; Brightness, Displacement, which bends the light to simulate the real world and Blur. Some of these controls are found in several locations making the adjustment of the pattern easier. When you have a filter set up you can name and save the filter for later use. Having the ability to throw different patterns of light into a photo is both very useful and very powerful. Now you may be wondering what a Photoshop plugin review is doing at a FCP web site. Since the earliest days of FCP we have been using Photoshop to create text and titles for our movies as well as still images to be included in with video. As many now use DVD Studio Pro as their delivery format, Photoshop is used not only for text and titles, but to create buttons and Menu background art as well. With Apple's soon to be released Motion, Photoshop will come into play in a big way yet again. 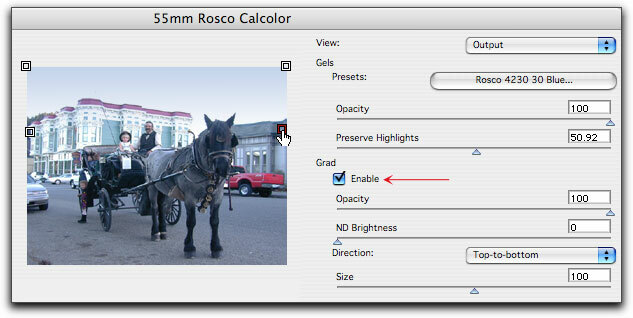 For photographers who are working on imagery in Photoshop the value of the 55mm filters should be obvious. This package of digital glass camera filters covers the spectrum of correction and special effects. From Glow to Film grain, Infrared and Polarizing, Lighting and Photographic effects, Color Correction and Bleach Bypass, Matte generation and much more, with either 8 or 16 bits per channel processing. Digital Film Tools has created an amazing set of filters in the 55mm filters package which offer an enormous degree of control and flexibility, they work extremely well, the effects generated are excellent. What makes these filters so powerful is that they offer us the ability to apply effects that might have been done while shooting, after the fact, in post. A second chance, as it were. In addition to simulate glass camera filters, gels and specialized lenses, the set includes a host of 'post' special effects. As there are a large number of Presets and Templates and because these effects are highly customizable and often integrated with each other, there is no limit to what you can achieve to create some magic in Photoshop. My only regret is that I did not have the 55mm Photoshop filters years ago.